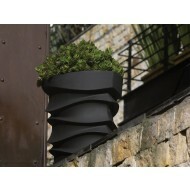 NewPro's collection of large outdoor planters is perfect for spacious indoor and outdoor landscaping designs. 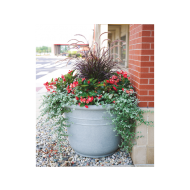 Manufactured using a rotational molding process, these oversized plant containers are not only lightweight and easy to install, but incredibly durable and weather resistant. Choose from an assortment of shapes, sizes, and faux stone colors. 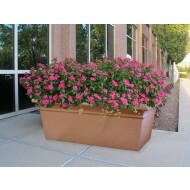 MegaPots and Curbside plant containers are great for special events and high traffic areas. 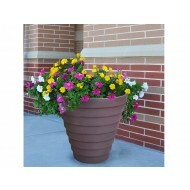 A commercial grade, roto-molded construction make for a nearly indestructable pot. The Mega outdoor collection is intelligently designed to mimic the appearance of a natural stone planter without one main disadvantage. Its weight. Large stone containers are heavy. Moving these beefy pots can be incredibily difficult if not near impossible. These large pots feature a slight taper allowing them to telescope within each other which allows for easy transportation and storage. 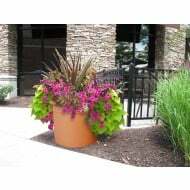 Save time on installations and maintenance with the MegaPots and Curbside brands. 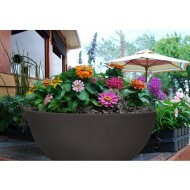 All Mega outdoor planters are made in the United States of America.